This study relied on both quantitative and qualitative approaches to its design, data gathering, and analysis with an aim to deepen understanding of the motivations, expectations, and experiences of individual African security sector professionals as well as glean broader trends. The process was further informed by numerous oral histories gathered by the authors and their respective institutions. Both the Kofi Annan International Peacekeeping Training Centre (KAIPTC) and the Africa Center for Strategic Studies (the Africa Center) regularly conduct trainings and other academic programs. Accordingly, they engage junior, mid-level, and senior African security sector professionals, both civilian and uniformed, on an ongoing basis. Given their longevity and established presence, both centers were also able to draw on their networks of relationships within the African security community to inform this research. This study took shape in three parts. First was a literature review of past studies, reports, and analyses examining the evolving attitudes, motivations, and norms of African security professionals. Given the underlying temporal dimension to this study, examining differences between the youngest generation of security sector professionals and their predecessors, this review involved both historical as well as contemporary and comparative assessments. Second, a large-scale anonymous survey of African security sector professionals was conducted, providing a statistical basis for generalization and comparative analysis of key elements of the research topic. Through a series of 23 multiple choice questions (with both single answer and “all that apply” options), the self-reported survey was structured to glean insights into four primary areas: motivations for joining the service, perceived values and identity of respondents’ respective branches of service, formative experiences, and views regarding international training partnerships. These topical areas of interest were complemented with basic demographic information to provide a basis for comparative analysis of the responses. In particular, the research aimed to assess differences across five main analytic categories (i.e., independent variables). This included the service sector (e.g., military, police, and gendarmerie), geographic region, age quartile, gender, and regime type of respondents (see Table 1). After piloting and testing the tool, a link to the survey was disseminated electronically to over 4,500 African security sector professionals in the Africa Center and KAIPTC databases. This was supplemented by dissemination to the network of professional military education institutions participating in the Africa Military Education Program (AMEP), as well as via word-of-mouth. In total, the survey period was open for 3 weeks—from April 1 to April 21, 2017. The survey was available in English, French, and Portuguese to increase its accessibility across the continent and improve the accuracy of responses. The Survey Monkey platform was used to administer the questionnaire and to ensure the anonymity of individual respondents. Responses were checked for plausibility, integrity, and completeness to ensure validity. Statistical software was then used to screen, code, and analyze the data. Third, a series of one-on-one interviews and small focus group discussions were conducted with 35 active duty military and police officers to gain a deeper understanding of the underlying rationale for the respective values and perceptions of African security sector professionals. Focus groups comprised three to five participants. The interviews were undertaken in various West African professional military education venues as well as in Washington, D.C. and were conducted on a not-for-attribution basis. While providing space for open-ended questions and responses, the interviews were semi-structured so as to build on themes identified in the questionnaires. This qualitative approach was intended to complement the survey data by unpacking some of the professional experiences and circumstances within which the cited values, attitudes, and motivations emerged. Likewise, the interviews were more suitable for describing the contextual factors affecting the professionals’ perspectives and to gain a better understanding of why and how such perspectives have changed. These qualitative insights were especially relevant given the relatively unexplored terrain of assessing attitudes of the next generation of African security sector professionals. The interviews thus provided the opportunity to uncover previously unconsidered insights and motivations as well as sometimes sensitive information based on personal experiences. To better weigh any findings or conclusions from this research, it is important to spell out some of the limitations of the survey methods. First, the quantitative results were extrapolated from a pool of 742 survey respondents. This sample size was sufficiently large and diverse to draw statistically significant inferences for many of the assessed co-factors of the analysis. Nevertheless, it should be recognized that this pool was not a random sample. Many of the respondents were linked, at least indirectly, to KAIPTC or Africa Center networks. This increases the representation of young, capable, and career-oriented officers whose backgrounds in terms of professional accomplishment, education, age, as well as their exposure to international actors, were likely more advanced vis-à-vis a more representative sample of all service members. While disproportionately large numbers of respondents were police and gendarmerie from West Africa (reflecting the base of KAIPTC’s networks), there were sufficient numbers of military personnel and respondents from other parts of the continent to generate robust comparative results. Similarly, given the strong participation from West Africa, the number of democratizing countries were somewhat overrepresented in the survey results. However, again, this was balanced by enough respondents operating under other regime types to draw statistically meaningful comparative observations. 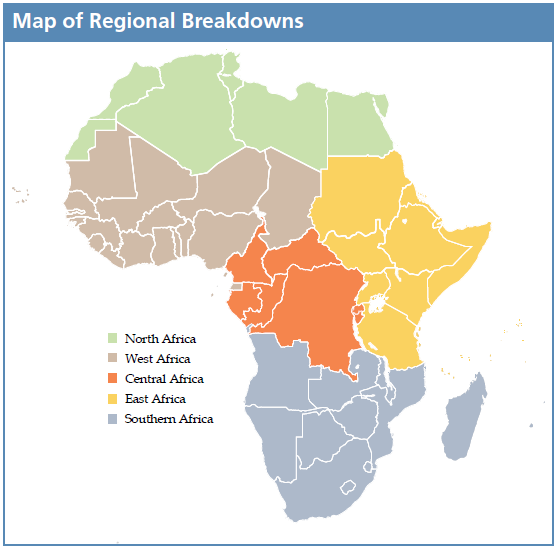 Second, while efforts were made to reach all regions of the continent, the number of survey respondents from North and Lusophone Africa were insufficient to draw out comparisons for these regions. Consequently, while the responses from the individuals in these regions are considered as part of the overall pool, regional comparisons, especially with North Africa could not be made. Similarly, while civilian respondents were part of the survey, their numbers were too small to enable statistically meaningful comparative generalizations. Finally, as this research is drawn from a single survey period, comparisons between age cohorts are based on responses from the respective cohorts at the time the survey was conducted. Responses to questions such as motivations for joining the service or formative experiences for those in the older cohorts, accordingly, are drawn from a wider base of experience than younger cohorts who are just starting their careers.